Colorado Ski & Snowboard Hall of Fame member Stein Eriksen passed yesterday, December 27, 2015, at the age of 88 at his home in Park City, Utah. As one of the most recognized names in the ski world, Stein was synonymous with skiing style and elegance for more than 60 years. The first alpine skier to win a trio of World Championships gold medals, along with an Olympic gold, he parlayed all that he knew and loved about the sport into an incredible career that spanned almost six decades and changed the face of skiing worldwide. Prior to joining Deer Valley Resort, he spent four years as director of skiing and the ski school in Snowmass, while also serving as ski school director in Aspen, where he owned his own sports shop. A private memorial will be held for family, followed by a celebration of Stein’s remarkable life, the details of which will be forthcoming. 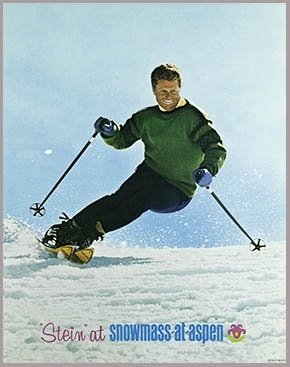 Stein Eriksen skiing Snowmass in the 60s.